I frequently come across recipes that call for “2 cups of shredded chicken” or “8 oz of chicken cooked and cubed”. Which is fine. Great even. 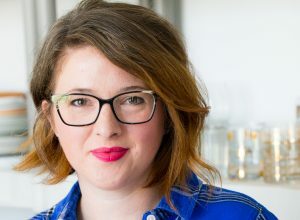 But when the directions say it is a 30 minute or a “quick & easy” recipe and then they don’t take into account for the amount of time it takes to cook and cube that chicken, it can be quite irritating. Especially when I don’t read through the entire recipe until 5:30 with the misguided hope of having dinner on the table by 6:00. Admittedly that is my fault. So to save me from, well, myself, I have gotten into the habit of cooking a large amount of chicken at once and then popping it in the freezer for future use in these sneaky recipes. I have made boneless skinless breasts in the crock pot and they taste alright, but not great. They come out with a flavorless quality that leaves me wanting more. This method of roasting the split chicken breasts, with bone and skin still intact, results in the most flavorful and juicy chicken I have ever tasted. Now I realize many of us shy away from eating chicken skin (with the exception of perhaps Joey Tribbiani). In my method, the skin is left on to keep the chicken moist and impart some flavor during the roasting and then the skin is removed before eating. This is a simple (brainless really) method for cooking chicken, and yet, yields the tastiest results. 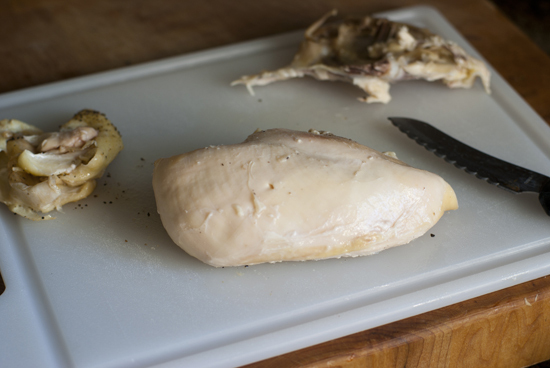 Place your split chicken breasts (bone in and skin on) on a roasting sheet. Rub each breast with 1 tsp of oil (or to your taste) and sprinkle with salt, pepper and garlic powder. Feel free to throw any herb of your choice on at this point. I often even sprinkle with Old Bay seasoning and it comes out finger licking good. Roast, uncovered, in a 350 degree oven for 45-50 minutes (or until chicken reaches 165 degrees on a meat thermometer). Remove chicken from oven and tent with a piece of foil and allow to rest for at least 10 minutes. After the resting time (10 minutes if you will be eating it immediately, or a bit longer if you are going to store it for later), remove the skin and take the chicken breast off the bones. I will usually flip the breast over and work my fingers under the bone to remove it in one large piece. Double check that there are no bony clingers hanging out in your chicken. Discard the skin but save the bones! 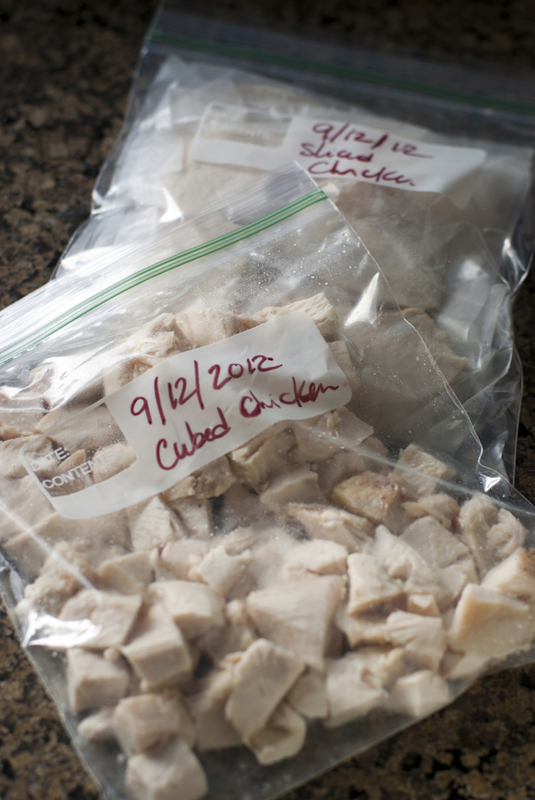 Pop the bones into a freezer bag and save a stash of them to make chicken stock later. Now here’s where you have some options. You can slice the breasts and layer them between wax paper sheets, place them in freezer bags and freeze them. Slices are great to use for sandwiches or salads. I have turned to this chicken instead of the ridiculous amounts of processed lunch meats that we had previously been eating. It’s so much healthier, cheaper and satisfying! You can also cube or shred up a breast to add to soups, stews or casseroles. Or freeze the breasts whole to keep your options open. We are entering the season of soups, stews and casseroles so I hope this helps you get a little head start on your Autumn dinners! Enjoy! 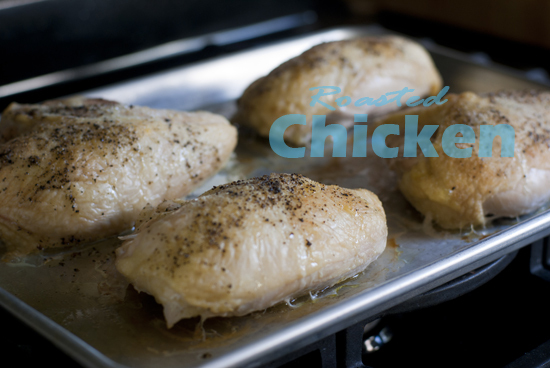 Place chicken breasts, skin side up on a rimmed baking sheet. Rub 1 teaspoon of olive oil into each breast, and season with salt, pepper and garlic powder. Feel free to play around with herbs and spices of your choice. Bake chicken, uncovered, for 45-50 minutes or until chicken reaches internal temperature of 165° on a meat thermometer. 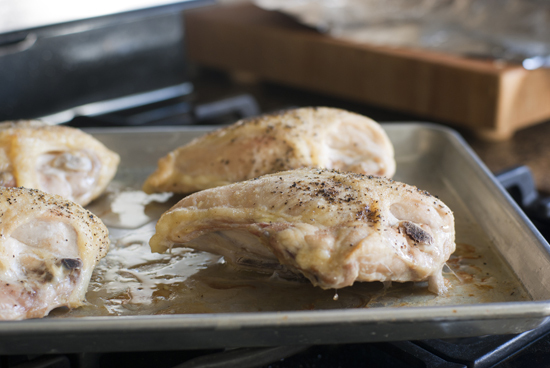 Remove chicken from oven, tent with a foil, and allow to rest for at least 10 minutes. 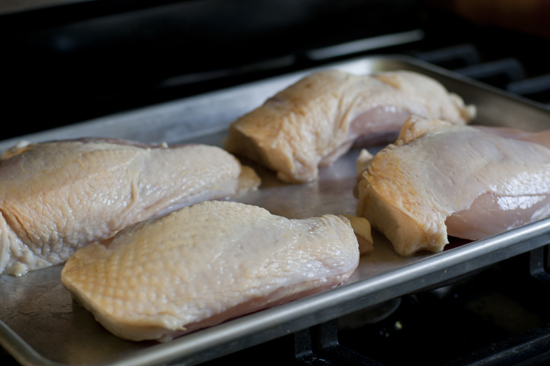 If freezing chicken, allow to cool and then remove and discard skin. Remove the meat from the bones, reserving the bones for use in stock. 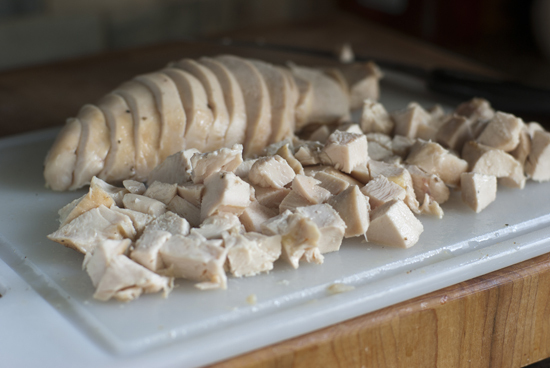 Slice, cube or shred the chicken and place in freezer bags (slices between pieces of wax paper for easy removal) and freeze for later use. This is a great idea. I make many dinners ahead and freeze them, but never thought of make chicken ahead and cutting it up for future use as in a pot pie.